228 pages | 13 B/W Illus. Japan’s heritage conservation policy and practice, as deployed through its foreign aid programs, has become one of the main means through which post-World War II Japan has sought to mark its presence in the international arena, both globally and regionally. Heritage conservation has been intimately linked to Japan’s sense of national identity, in addition to its self-portrayal as a responsible global and regional citizen. This book explores the concepts of heritage, nationalism and Japanese national identity in the context of Japanese and international history since the second half of the nineteenth century. In doing so, it shows how Japan has built on its distinctive approach to conservation to develop a heritage-based strategy, which has been used as part of its cultural diplomacy designed to increase its ‘soft power’ both globally and within the Asian region. 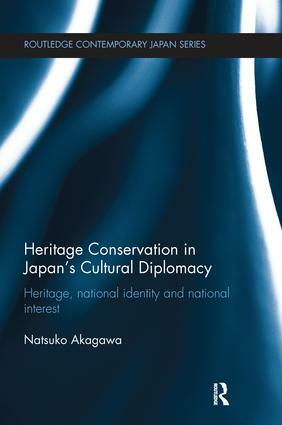 More broadly, Natsuko Akagawa underlines the theoretical nexus between the politics of heritage conservation, cultural diplomacy and national interest, and in turn highlights how issues of heritage conservation practice and policy are crucial to a comprehensive understanding of geo-politics. Heritage Conservation and Japan’s Cultural Diplomacy will be of great interest to students, scholars and professionals working in the fields of heritage and museum studies, heritage conservation, international relations and Asian/Japanese studies. Introduction: Heritage Conservation in Global and Regional Cultural Diplomacy 1. Unpacking Heritage: Deconstruction and Construction of Heritage 2. National Identity, Nationalism and Japanese Identity 3. Japanese Heritage Conservation Approach and Authenticity 4. Japan in the Global Heritage Context 5. Intangible Heritage 6. Vietnam Case Study: Vietnam’s Nationalist History and Japan’s ODA to Vietnam 7. Vietnam Case Study: Can Chanh Palace and Nha Nhac Court Music in Hue 8. Conclusion: Japan a ‘Cultural Nation’? Natsuko Akagawa is Assistant Professor of Asian Studies in the School of Social Sciences at the University of Western Australia.